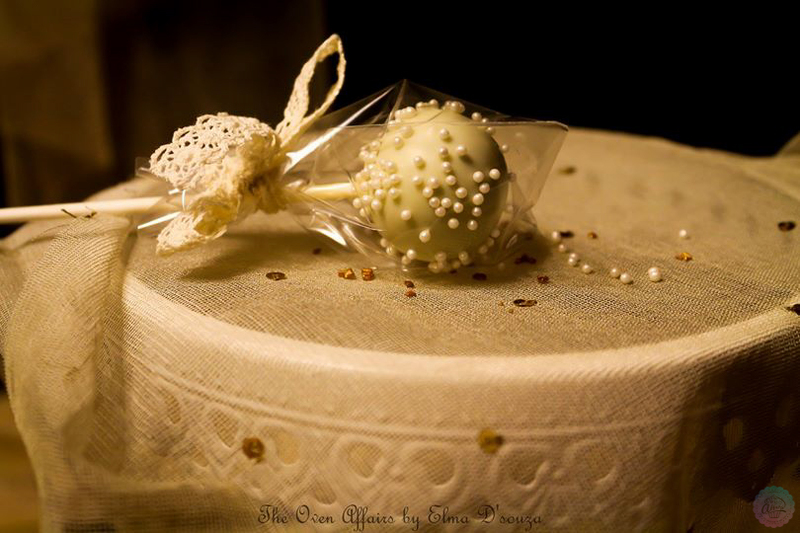 A beaming number of 500 cake pops were commissioned for the Nuptial ceremony of Kieve & Vanessa. They were assorted into four flavours-Vanilla with Hazelnut blend, Vanilla with seasoned fig, Carrot & Red Velvet. The colours-Ivory with a Gold sheen, Pearl white, Blush & Peach were used in combination with sugar pearls, sugar lace & bronze crunch in order to match the Bride's gown & Bouquet. I sincerely thank Mr & Mrs. Pinto and Diana D'Souza for entrusting me with this beautiful theme.It was a day of great joy for us to witness the ceremony & spread the good news through these sweet favors.